High Desert Harmony celebrated the holiday season in grand style on Dec. 10, 2018 with "High Desert Holidays," at McKinley Arts & Culture Center in Reno. We were thrilled to have a sellout crowd on hand to enjoy our traditional holiday favorites, as well as the enthusiastic musical offerings of Reno High School's women's chorus and Echo Loder Elementary School's honor choir. 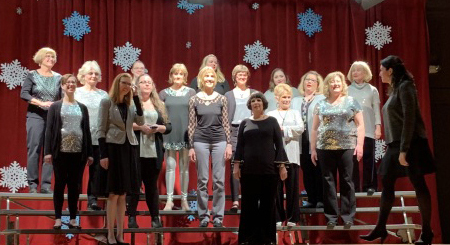 High Desert Harmony was joined for three songs by our first-ever Holiday Guest Chorus -- 14 ladies from the community who rehearsed with us for five weeks prior to the show to get a taste of the fun and excitement of barbershop music. It was wonderful having these enthusiastic ladies on stage with us and we hope they'll be back for more in the New Year!